Last summer, we told you about a multimedia blues project called True Blues featuring the likes of Taj Mahal, Shemekia Copeland, Corey Harris, Alvin Youngblood Hart, Phil Wiggins, and Guy Davis. In addition to the true gem of a CD (of which everyone should have a copy), a DVD is also completed and on its way, while members of the project continue to take their music to different cities around the U.S. as part of a tour. This past Saturday was Pittsburgh’s turn to get the True Blues, when Corey Harris, Alvin Youngblood Hart, and Guy Davis visited the Carnegie Lecture Hall in Oakland for a show sponsored by the Pittsburgh Folk Music Society Calliope, with each of the musicians performing a solo set before they came together for a few songs at night’s end. Davis was the first to take the stage, playing a half-hour set that started on the uptempo country sounds of “Maggie Campbell Blues” before diving into a few numbers from the True Blues CD with the creeping, scratchy-throated “Saturday Blues” and ambling “That’s No Way to Get Along” (Reverend Robert Wilkins). From there, the modern-day troubadour introduced some harmonica to the guitar-and-vocals mix with the sweet diddy of an original “Love Looks Good on You”, then standing and subsequently moving out to the audience’s front row for the Bumble Bee Slim tune “Bumble Bee Blues”. The son of famed actors Ossie Davis and Ruby Dee, Davis himself has developed quite a knack for working the crowd, injecting plenty of stories and humor throughout his performance, including observing, while tuning his guitar for the racy “Bumble Bee Blues”, that “This is not the kind of song where you want a defective G string”. Putting down the guitar, Davis closed the set with a stompin’-good tribute to harmonica ace Sonny Terry in “Did You See My Baby”. California native Hart was the next up, kicking things off with the slow blues of “Mama Don’t Allow” before hitting on such treasures as “Them Fair Weather Friends” and “Big Mama’s Door”, all the while combining some impressive guitar talents with his trademark leathery vocals. But the highlight of the 35-minute set for us came with the closing “Gallows Pole” (Leadbelly), probably the first song we can remember hearing from Hart a few decades back and one that he also revisits on True Blues. 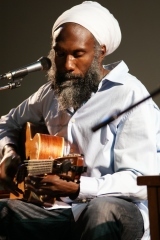 Harris concluded the solo performances with a short but inspired 20 minutes of material that started on a “High Fever Blues” that could easily be mistaken for something from Charlie Patton but that Harris himself actually wrote when sick with the chicken pox, serving as a prime example of the genius of Corey Harris (who, in 2007, actually was recognized as a genius when he was awarded a prestigious MacArthur Foundation “genius” fellowship for his commitment and innovation in helping to carry the traditional blues into the 21st century). That was followed by the poignant, close-to-home lyrics of “Fulton Blues”, an uptempo “Too Tight Rag” (Blind Blake), the haunting “Devil Got My Woman” (Skip James) and a dark, creeping “King Cotton” before he welcomed Hart and Davis back to the stage for a few numbers. As good as each of these guys is individually, they’re a delight to see playing together, taking turns on solos and vocals through such songs as Skip James’ “He’s a Mighty Good Leader”, a “Little Red Rooster” that found Davis back on harmonica in addition to guitar, and an encore of “Hoochie Coochie Man”. In fact, if we had one criticism of the show, it would only be that we didn’t get a bit longer of a combined set from the group than the 20 minutes or so they provided here. Of course, that just may be a case of us looking the proverbial gift horse in the mouth; these guys could have played all night and it still probably wouldn’t have been long enough for some of us. Shows and performers like this simply don’t come around often, so when they do, you want to take in as much of them as you can get. Fortunately, there’s that DVD on the way to help extend the experience, but in the meantime, be sure to catch these guys if you can. Individually as well as collectively, they are – as advertised – true blues. 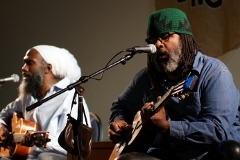 This entry was posted in Shows and tagged Alvin Youngblood Hart, Corey Harris, Guy Davis. Bookmark the permalink.